Apple announced the iPhone XS and iPhone XS Max at Wednesday’s big event. Both devices will be available for pre-order this Friday. 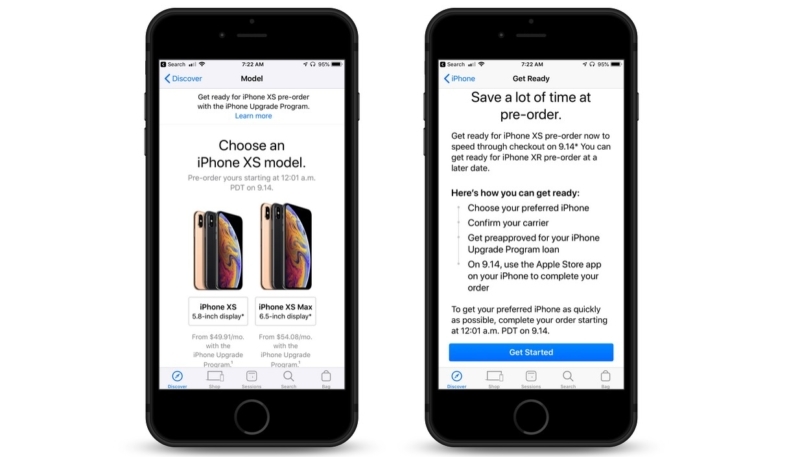 To get ready, buyers can get pre-approval for Apple’s iPhone Upgrade Program via the Apple Store app. When users tap “View Pricing” on the iPhone XS or iPhone XS Max, they’ll see a banner option to “Get Ready” for the iPhone XS pre-order. Tapping on the link takes the user to a section where they can select an iPhone, confirm their carrier, and get pre-approval for an iPhone Upgrade Program loan. Existing iPhone Upgrade Program customers can get ready for Friday under the “Get ready for pre-order now” option. All users that are opting to use the iPhone Upgrade Program, both new and existing, are advised to go through the pre-approval process ahead of Friday’s pre-order frenzy. It’ll help them get through the process at a faster pace, upping their chances of getting the iPhone they want. Pre-approvals are available until 4:00 p.m. on Thursday, September 13. Pre-orders are set to start at 12:01 a.m. Pacific time/2:01 a.m. Central time/3:01 a.m. Eastern time on Friday, September 14. Next Up Is Apple Hoping Everyone Will Forget About the AirPower Wireless Charger?